Jupiter is the Roman name for the Greek god Zeus. Zeus was the youngest son of Cronos (Saturn), lord of the universe, and Rhea. Earlier, Cronos had slain his own father, Uranus, and unseated him from the Throne of Eternity. In the process, Uranus warned Cronos that he too would suffer the same fate. To prevent being dethroned by his own son, Cronos swallowed each of his children as it was born. 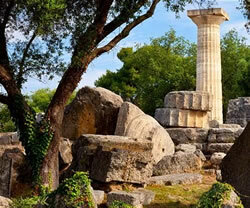 However, when Zeus was born, his mother hid him away to a secret island so that Cronos would not find him. To thank his caretakers, Zeus gave them the horns of plenty from the fairy goat, Amaltheia, which could never be emptied. 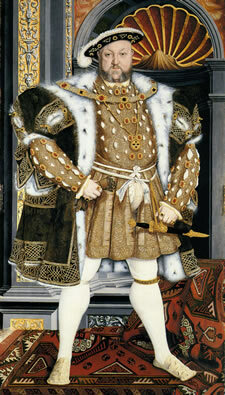 He grew to be a splendid young god and soon overpowered his father, causing Cronos to vomit up all the other children. Once he had freed his siblings, Zeus then freed the monstrous children of Mother Earth from their pit deep in the earth. They were so grateful that they forged for Zeus his famous thunderbolts. 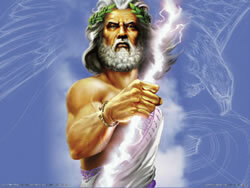 Zeus became the most powerful of all the ancient gods. He was God of the sky and supreme ruler of Mount Olympus. He upheld law, justice and morals. He was the guardian of political order and peace. Zeus was mighty, glorious, awesome and wise. He was, however, prone to falling in love and using many forms of trickery not only to hide his infidelity from his wife, Hera, but to seduce many an unsuspecting maiden. Yet deceptive as he was, he demanded honor from others. His bird is the lofty eagle, symbol of truth and principles. His tree is the mighty oak, and it is said that his will is revealed through the rustling of leaves. The Temple of Zeus in Olympia, Greece contained the majestic gold and ivory statue of Zeus built by the sculptor, Phidias in 432 BC. Standing more than 40 feet high and 22 feet wide, it was one of the Seven Wonders of the ancient world. Destroyed by the Christians in the fourth century AD, all that remains are the fallen columns of the once magnificent temple. Astrologically, Jupiter rules expansion and joy, feeling good and wanting more. The biggest problem with Jupiter is that he doesn't know when to quit. Taking on too much is a common problem when we come under the influence of our jovial friend. Too much food, too much drink, too much work, too much everything. Wanting more has its downside, too. When you get it, you may begin to feel haughty and arrogant about what you have. Taken to extremes, you may begin to feel that you have a right to it. You may become tyranical in your pursuit of "more" and look down on those who do not "have". Learning to judge how much of a good thing is enough is one of the major lessons involved with Jupiter. Because it requires learning to intract with those outside of ourselves, Jupiter is classified as one of the Social Planets. The house where you find Jupiter in your natal horoscope describes what parts of your life will feel the pressure to grow and expand. The sign Jupiter is in tells about how you cope with this expansion. Whether you grow willingly or whether you're kicking and screaming all the way, you will get to be a bigger person. Eventually you'll get wiser too. But we must not forget Zeus' thunderbolts. "By Jove!" is a real phenomenon. There is a bit of luck involved wherever Jupiter roams. 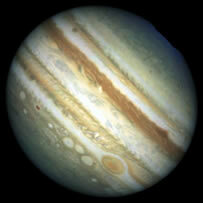 Jupiter is the largest of all our planets, nearly 11 times the diameter of Earth. It's speedy too. A Jupiter day is less than 10 hours Earth time. Not bad for someone of that girth! But still, since Jupiter is over 480 million miles away from the Sun, it takes almost 12 years to complete one orbit around the Sun. Jupiter turns retrograde every 13 months, for a period lasting about four months.